Getting started with showing first requires the purchase of a well bred specimen from a responsible breeder. There are many such breeders here in California and through out the United States. Many excellent show prospects produced by these breeders go to non-show homes every year. Most of these breeders would love to help you to get started in showing. A good place to start looking is our Member Breeder listing on this website. While, like most responsible breeders, the listed breeders don’t breed very often, when they do they almost always have show prospects available from their litters. If our local breeders don’t have a Basset Hound puppy available you have several options. First of all check with our local breeders about their future breeding plans. Some may be planning a breeding or they can at least refer you to someone who is planning on having a litter. Another option is to check with the Breeder Directory on the Basset Hound Club of America website. While they might not be close to you many of these breeders have excellent reputations and would be happy to help you get started. The vast majority of responsible breeders are members of their national breed club and at least one local breed or all-breed kennel club. Basset Hound breeders should at least belong to their local Basset Hound club and/or the Basset Hound Club of America. These organizations will most likely have codes of ethics that their members are expected to follow. Check for breed club membership before you even contact any breeder. Yes, you could also start shopping for a show prospect on the Internet. This is where you need to be most careful. While many responsible breeders do have websites the vast majority of people who sell puppies over the Internet are just out to make money. Read our page, Responsible Breeder, which could save you a lot of time and heartaches. The utmost of care and investigation is suggested when looking at websites and talking to breeders whom you find on the Internet. Unless the breeder actually shows their own dogs with regular success and you can verify that fact stay away. By success we mean that they have actually bred several AKC Champions either in conformation or some kind of AKC event. Some Internet puppy sellers actually try to fake their participation in AKC events. Many will do or promise anything if they think it will sell a dog. What’s most important is finding the Basset Hound that is right for you and your family. A responsible breeder will ask you far more questions than you’ll ask them. They want assurance that their Bassets are going to the best home possible. Most will take the utmost care to make sure that happens. If a breeder doesn't seem to care about your family and home go somewhere else. Join the World of AKC Dog Shows! It’s a lot of fun! Important things to lookout for when buying any puppy. Any intact (not spayed/neutered) dog registered with the American Kennel Club that is 6 months or older on the day of the show and of a breed for which classes are offered in the premium list is eligible to be entered at a dog show. Dogs with disqualifying faults according to their breed's Standard can not be shown however. Yes, that's a mouthful of words. If you have an intact well bred basset hound puppy that is six months old or older with no disqualifying faults based on AKC rules and the Basset Hound Standard, the puppy can be shown. This is where getting a Basset from a responsible breeder pays off. Your breeder and local Basset Hound club will come in handy in making decision about showing. They should provide you with a fair evaluation of your Basset Hound based on the AKC Standard for Basset Hounds. This is what the judges at shows will be judging your dog against. Remember, there is no such thing as the perfect dog. The judges weigh the qualities they see, both good and bad, and award the dogs that they feel best meet the Standard. If you have attended a dog show, you've already taken an important step in getting involved in the sport of showing your dog. If you haven't yet attended a show make an effort to do so. These shows aren’t “beauty contests” as some believe. At dog shows AKC licensed judges judge all the dogs for each breed against the AKC Standard for that particular breed. Watching judging at a dog show will help you understand. Please feel free to approach one of the exhibitors who is ringside to tell you what’s going on. Just make sure they aren’t busy grooming their dog, concentrating on what the judge is doing or getting ready to go in with their dog. To find out about AKC dog events in your area, you can check the event calendar on this website. How do I show my dog? Your breeder is the best source for handling help. First of all your breeder, if they live in your area, may offer to handle your puppy for you. Even if you’d like to learn how to show this is a great way to get started. If you’d like to show your own dog they can give you pointers and information on dog handling classes in the area. Your local breeders should know which handling class is being by someone who knows how to handle Basset Hounds. Handling classes are usually held on weeknights and will teach you the basics of handling your dog. It would also be to your benefit to ask how you may go about joining the local Basset Hound club as you are new to the sport and would like to get involved. You'll meet great people who are willing to share their knowledge and experiences. The club may also have information about match shows in your area. These are fun shows that are used for practice and training of both dogs and novice exhibitors. 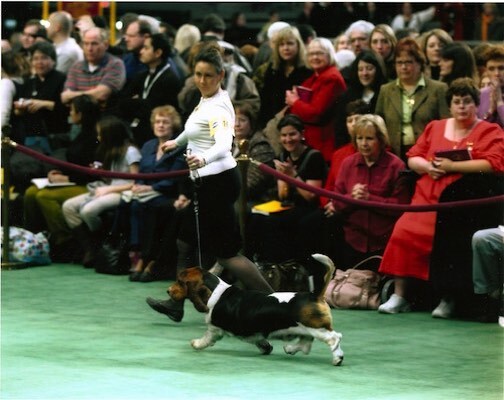 While these shows award no points toward an AKC title, they are a great place to "get your feet wet" before entering a real show. One thing you’ll love about showing a Basset Hound is that we’re a very friendly bunch. Unlike many breeds most of us show our own dogs. We’re very passionate about our breed and enjoy the experience of being in the show ring with them. If you need help in the ring don't hesitate to ask another exhibitor. Will the breeder show my dog? Most basset breeders know how to handle Basset Hounds. The majority of basset hounds shown on Southern California are shown by their breeders. These breeders are often willing to show bassets that they have bred and sold to a family that hasn't been involved in showing dogs. They want their bassets in the local show rings and they want to encourage new people to get involved in our sport. If you're interested in having your breeder show your basset hound ask. If you don't wish to handle your dog yourself and your breeder can’t help, you may contact a professional handler to show your dog. Professional handlers charge a fee for showing dogs, so before hiring a handler make sure you obtain a schedule of the fee. Prepare for a price shock. Professional handlers can get very expensive. Many don’t have any idea how to show a Basset Hound. Check with your breeder for possible professionals. Perhaps they use one. You can also talk to several handlers, get copies of their rate schedules and visit their facilities. Observe them both in and out of the ring before making up your mind which handler to choose. You will be entrusting them with your dog's care, so make sure you are entirely comfortable before doing so. If there is something you don't understand, make sure the prospective handler answers all of your questions before entering into any agreement. Remember that professional handlers may have scheduling conflicts at shows and they may not be the person who actually takes your Basset Hound into the ring. That job may fall to one of their assistants or another professional handler who may have never even seen your dog before entering the ring with it. This is especially common with new clients or clients that don’t sign a long term contract. So now you're ready to get started. Dog shows are a sport that will bring many hours of enjoyment and education to every member of your family. You will make many friends in the sport, and will enjoy your dog and your new hobby to the fullest extent. For more information on showing check out the following two pages on this website: Dog Shows Explained & Dog Show Vocabulary. Good luck! If you have ANY questions about how to find a show prospect or anything related to showing your Basset Hound please let me know. I’m here to help. If I can’t answer your question I’ll find someone who can. EMAIL ME or talk with me at a show or club meeting. I’d be thrilled to help you get started showing a Basset Hound. Basset hound breeders and owners are a great group of people.